Many journalists contend that the more access they have, the better. I subscribe to that idea, but believe a line must be drawn for too much access. I draw that line at knowing a person's masturbatory habits. Some taboos need to be broken, such as the smell connected to asparagus urine, but self-love may not be one of them. It is not because this taboo is awkward or uncomfortable, but because nearly every song about the subject is horrible. 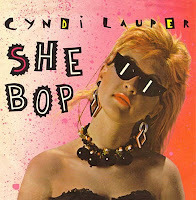 A lot of people say Cyndi Lauper's 1983 tune "She Bop" is tops when it comes to songs with masturbatory themes. I like "She Bop" more now than when it was released and was unaware of its self-love theme until a knowledgeable friend told me about it. But, quite frankly, I never feel fulfilled listening to "She Bop." The Divinyls' "I Touch Myself" is the most blatant example that explores this theme, but it is too obvious and an accidental joke song. Other songs, such as Aerosmith's "Love in an Elevator," seem to be about self-love if they were about me, but not everyone has my interpretation. With all these mishits with masturbation songs, Billy Idol's "Dancing with Myself" has to be the best song with this theme. But here's the rub: Idol has said in interviews that the song is not meant to be about the taboo, but merely about people who dance alone.